Seven Chocolate Dipped Potato Chip Cookies. This Chocolate dipped potato chip cookie recipe I came across on the Chew about a year ago and I was skeptical. I mean I love the sweet and salty combination trust me, but adding potato chips to cookies sounded a little odd but I was willing to give it a shot. I mean after all I am from Michigan home of Better Made Potato chips. Better Mades have never let me down yet why not give them a chance to shine in a cookie. As we are onto day seven you have to imagine by now how many cookies I have baked over the last two months. If you thought that I have been eating them all you must be CRAZY! Just think not all of them made the cut so to speak. I have had cookies coming out my ears, and I would be the size of a small house! I’m not ashamed to admit I have a team of volunteer cookie tasters. It just so happens that these bad boys were in a box sent overseas to my friend who serves in the Air Force (he’s like where’s Waldo you never really know where he is). Mike along with his fellow Air Force peeps volunteered to taste test boxes of cookies if I mailed them over. Each time I sent cookies I would send one, or two normal cookies like chocolate chip, then I would also send over “wildcard” cookies. 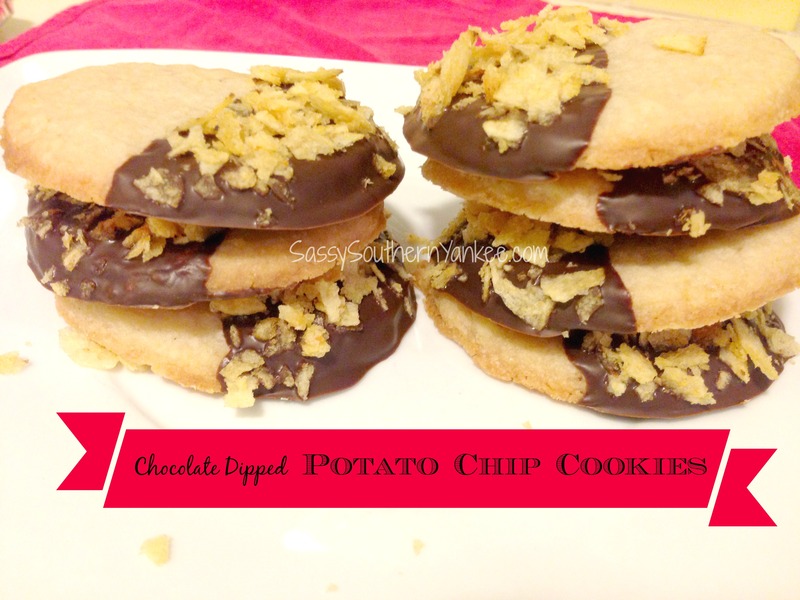 Well this chocolate dipped potato chip cookie was one of the said “wildcard” that made the cut. A huge thank you to Mike and his team for feedback. Also for taking one for the team and eating the good, bad, and ugly cookie concoctions I mailed over! Chocolate Dipped Potato Chip Cookies are sure to satisfy your sweet and salty craving this holiday season. In your upright mixer combine the butter, sugar, vanilla. Beat until the mixture is smooth. Next add in the flour and the 3/4 C crushed potato chips being sure not to over beat. You want to have the little pieces of potato chips in the cookies. Once the dough is formed you can either drop it onto a parchment lined cookie sheet or you can roll out the dough like I did, and make cut outs for a more uniformed look. I for some reason couldn’t find my biscuit cutter, so I used a juice glass to make the rounds. Bake in a 350* oven for approximately 12 minuets or until the bottoms are golden. 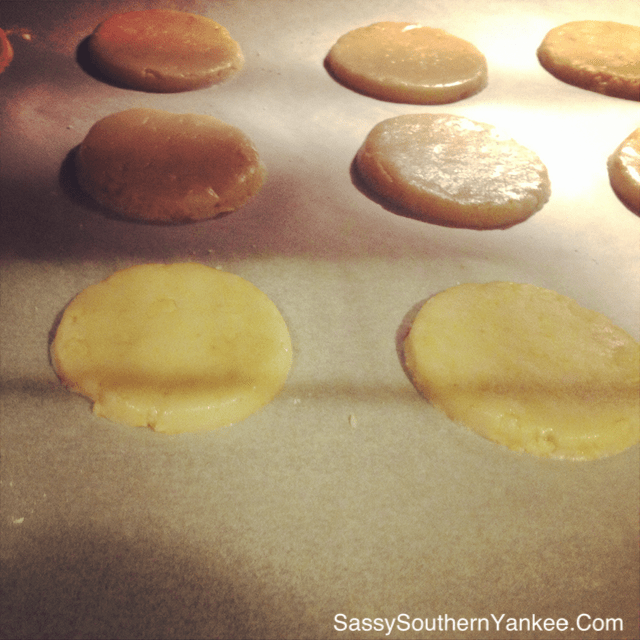 Remove from the oven and allow the cookies to cool completely. Next in a bow melt your chocolate chips (if it’s too thick you can always thin out the chocolate with some shortening or coconut oil). Dip the cookies in the chocolate half way then dip them into the crushed potato chips and place on parchment paper to allow the chocolate to set (you can set the chocolate quicker if you pop them into the refrigerator ). In your upright mixer combine the butter, sugar, vanilla. Beat until the mixture is smooth. Next add in the flour and the ¾ C crushed potato chips being sure not to over beat. You want to have the little pieces of potato chips in the cookies. Once the dough is formed you can either drop it onto a parchment lined cookie sheet or you can roll out the dough like I did, and make cut outs for a more uniformed look. I for some reason couldn't find my biscuit cutter, so I used a juice glass to make the rounds. Bake in a 350* oven for approximately 12 minuets or until the bottoms are golden. Remove from the oven and allow the cookies to cool completely. Next in a bow melt your chocolate chips (if it's too thick you can always thin out the chocolate with some shortening or coconut oil). Dip the cookies in the chocolate half way then dip them into the crushed potato chips and place on parchment paper to allow the chocolate to set (you can set the chocolate quicker if you pop them into the refrigerator ). This entry was posted in Cookies, Dessert and tagged Better Mades, Chocolate, Chocolate Dipped Potato Chip Cookie, Christmas Cookies, Cookie, Detroit Favorite, Holiday Cookie, Potato Chip, Salty, Sweet.